Having grown up in Boxford, a neighboring suburb of Lawrence, where opportunities to participate in sports were everywhere, I was shocked to learn, while working for after-school program, YDO, that Lawrence did not support any travel soccer leagues or teams. I would meet kids, daily who told me that they “didn’t play any sports,” which made sense why the high school, despite a student body of 3,000, did not support a girls’ varsity team. There was no youth feeder program! Supported and encouraged by my family, especially my mother, Ellen, who was my youth coach before I captained the University of Michigan Women’s Soccer team in the late 90’s, we started our Lawrence soccer journey in 2007 with 12 girls from 4 middle schools. These girls began with indoor and local tournament play, quickly gravitating to this new team concept, naming themselves the “Wolves.” As expected, they were exceptionally challenged, playing against teams with far more experience and resources. Victory was not something that came easily. The girls, however, were learning valuable lessons; the importance of teamwork, dedication and good sportsmanship. 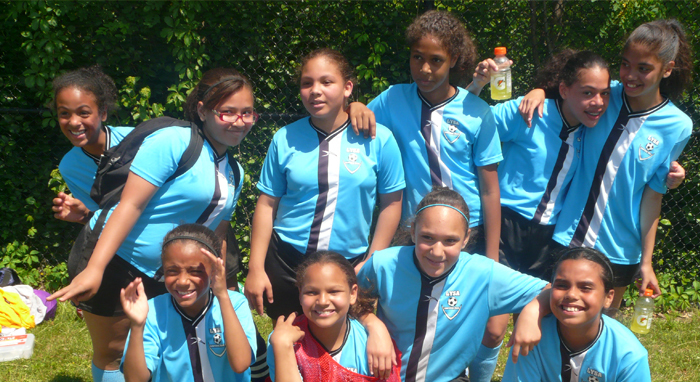 Finally, after much education and hard work, the Wolves proudly qualified for competition in the 2009 Essex County Youth Soccer league, becoming the City’s FIRST-ever girls’ soccer team!! [Read Boston Globe’s 2010 Article: For Lawrence Kids, a Soccer Mom and Daughter]. Buoyed by the success of this first group, and the addition of compassionate adult mentors and coaches, we expanded our teams and began supplementing kids’ sports experiences with “off the field” programs that increased academic performance, improved health and cultivated leadership skills. Today, we boost a 10-year track record and a well-developed philosophy and working model of how soccer can be used as a tool to stabilize and improve kids’ lives and combat social issues like childhood obesity and the disproportionate achievement gap linked to low income communities. Our progress has been extraordinary since our official incorporation in 2011. At that time, we were reaching 300 elementary and middle school students and our presence in the schools was limited to one school partner. Fast forward 8 years and we’ve impacted 3,700+ students, ages 4-18, sponsored more than 650 hrs of annual summer sports camps/clinics, including a first of its kind Lawrence Sports Leadership Academy and 8 public school partnerships that bring sport and nutrition curriculum to students during their school-day. Stories like these keep us fighting for resources so we can pull more young kids into our long-term support network that helps kids develop the tools and self-confidence to be successful in the world.